Spring is here and the vines have woken up from a winter rest. During the rainy winter season, we saw record-breaking precipitation numbers from a strong El Nino event. From October 2015 to March 2016, the Willamette Valley recorded 39.58 inches of rainfall (1) and in December alone we recorded over 15 inches of rain! Very few days dipped below freezing and it was a warm El Nino winter. 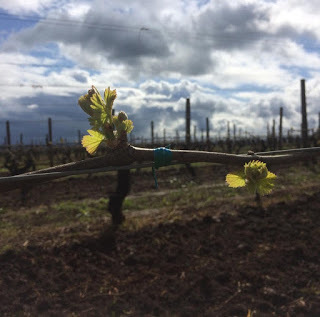 After a mild Oregon winter, the vineyard staff is eager to begin the growing season early, yet again this year. For the 3rd year in a row, bud break is being reported throughout the Willamette Valley starting in late March and continuing thru April. Now that the vines are starting to grow, we pay very close attention to the weather forecast for frost or hail events. As the winter rains have slowed down it has cleared the way for a few warm and sunny days. As soon as the ground was dry enough to work, the vineyard staff began preparing the vines for the growing season. We still have rain occurring weekly, so many of the vineyard activities are done in short windows of opportunity when Mother Nature allows us the chance. Its hectic and busy time of year trying to prepare our existing vineyards for the coming year and prepare prime agriculture land for over 100 acres of new plantings. Our experienced vineyard staff has pruned all the vines with excellent care, mulched last year’s canes to return organic matter back into the soil, and tilled alternate rows of cover crop to achieve the perfect balance of nutrition and vigor. We have also begun soil sampling, weed, pest and insect scouting. 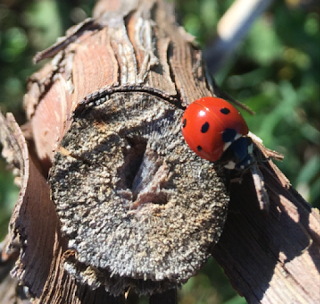 Some insects like the lady beetle shown below are helpful additions to our Certified Sustainable vineyard program. This little lady bug is munching on mites that overwinter in the bark. If the current weather trends continue as forecasted we should be expecting another gorgeous Oregon vintage!